Black flexible adhesive sealant with proven resistance to sea water and UV radiation. 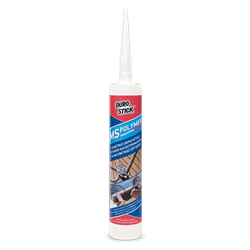 The hybrid technology of the polymer modified silane based MS-Polymer sealant covers a multitude of application needs for waterproofing as well as sealing. Key features include high mechanical strengths and unbreakable bonding. It is unaffected from prolonged sun and salts exposure. Resistant to temperature variations from -40°C to +120°C. Applications on sound surfaces do not require any priming, while due to its high thixotropy it does not sag. The product is sandable and it does not discolor over time. Suitable for wood decks of yachts and ships. It is recommended for sealing wood floor joints in homes, both indoors and out, especially in saunas, swimming pools, fitness centers etc. Indicatively, one 300ml cartridge fills 8.6 linear meters of a 6x6mm joint.